On December 4, 2018, the next lesson of patriotism was held in the library of "Ivan Vazov" Secondary school, Sopot. 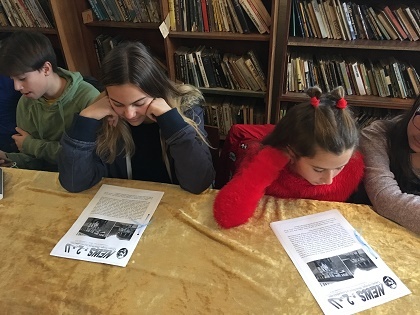 It was attended by students from 5-7 grade and teachers, with guest lecturers Ivan Kanchev and Martin Stamatov from the team of the Bulgarian History Association. They started the lesson with a personal story about their love for history. They continued with a presentation on the site https://bulgarianhistory.org. and featured films from the series "Our Generals", focusing on a gen. Georgi Vazov. In a very attractive and modern way,were presented Dan Kolov, Assen Yordanov and other little known Bulgarians left a lasting trace of science, sport, literature and military, which make us proud and love more than anything Bulgaria. 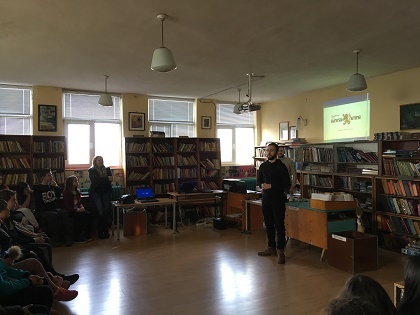 At the end of November, the presentation of "NEWS - 2 - U" took place in the library of "Ivan Vazov" Secondary school - Sopot. The newspaper is prepared by seventh-grade and sixth-grade students in optional English lessons, with Ralitsa Doninska, lecturer. The first issue provides information on: the visit to La Pobla de Segur, Catalonia, Spain to the Erasmus + program, the Healthy Life is Happy Life project; traditional English festivals; favorite video games; tourist destinations in Bulgaria; fun pages with interesting facts and a crossword puzzle. On November 21st, the church celebrates the Feast of the Virgin, the Day of the Christian Family and Youth. Traditionally, this holiday is celebrated by the youngest students of "Ivan Vazov" Secondary school. 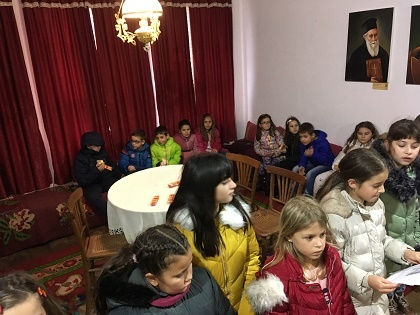 In the school library, the students of Mrs. Tsvetelina Todorova, the head of Religions – Orthodoxy classes, arranged a festive table in front of the Virgin Mary icon, presented a presentation, told about the Christian traditions and folk customs for this celebration of the fourth grade and the guests. They read the poems for the family, puzzled, and finished with the Vasov’s prayer.Third Graders took part in the liturgy of the Church of Our Lady. Group and individual drawings on "Me and my family" will present the school at the exhibition in the Town Hall "Ivan Vazov-1871" - Sopot.